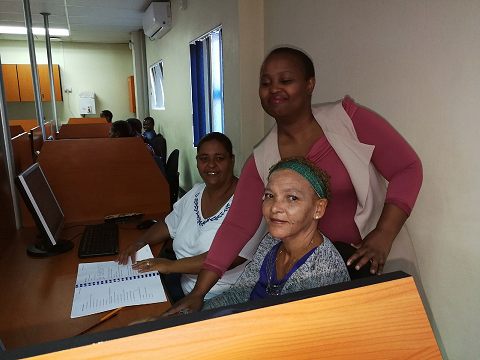 Over the past decade, Engen’s free computer skills training has been transforming lives in South Durban, instilling students across the age spectrum with the confidence and knowledge to secure jobs that would otherwise never have been possible. “Engen has created a future for us all,” graduate Sandra Matthys says of the initiative, which has seen Engen sponsor training to the value of R2 618 784 per annum. Another graduate, Brian Ngcongo, says Engen has brought “life and hope to the community” with its Community Computer Training Centre. 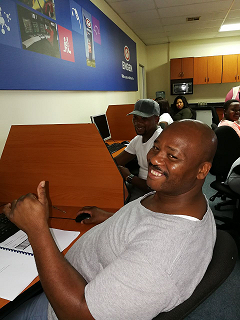 The centre provides introductory-level computer skills covering nine units of the National Certificate: Information Technology – End User Computing. All applicants must be unemployed school-leavers from the Durban South area. Although matric is not a requirement, and while they can be any age, most students are aged from 20 to 40. With securing employment the primary objective, the course has already upskilled more than 1 700 people since its inception. Statistics are incomplete due to the difficulty of keeping track of everyone, but in the past two years at least 77 students have secured jobs or have been accepted into learnership programmes. Last year 12 students found jobs during their training. Sheryl Casalis, training director of Added Advantage Academy, which has provided the training since 2009, says Engen spends close to R15 000 per student on two four-month courses for 80 people each, reaching around 160 students every year. “The competency rate for students is between 94% and 96% by the time they complete the course. They become computer literate individuals able to work independently using the most common computer programmes utilised in offices today,” she says. The current course ends in May, with the second 2018 course commencing in July. Adhila Hamdulay, Engen’s Corporate Social Investment Manager says the centre is well known in the community, and they always have waiting lists. Graduate Ngcongo says there are many people like him who could never afford this type of training, but who are now looking “towards a bright future” thanks to Engen. “Most of us have matriculated, although the course also caters for those who haven’t. But what we all needed was this boost. “I cannot thank Engen enough for supporting our dreams, and giving us this platform to help us realise those dreams,” he says, applauding the professionalism, friendliness and patience of all the centre staff. “You believed in each and every one of us, and gave us 100% commitment,” adds Ngcongo. Fellow graduate Fayrus Moola hails the course as an “essential community upliftment project” that instils confidence and assurance in students, changing the course of their lives. “Engen’s efforts to uplift this community are much appreciated,” she says. Hamdulay says Engen is extremely proud and humbled to have played such a significant role in changing lives in the Durban South community, where the Engen Refinery is situated. “With poverty and unemployment rife in South Africa, Engen is cognisant of the fact that the government cannot be relied on to provide the solutions alone. As such, we are committed to stepping up and doing the right thing, starting with paying special attention to the people in the communities in which we operate,” says Hamdulay.